The two-hour session to craft a bit of a vision for Ben's future is coming up. We're using a tool called Passport, developed by Community Living. I like its concepts. Sections include My Story; The Suitcase (the positive qualities the person brings); The Scroll (current supports), The Globe (the person's dream of what a good life will look like); The Yield Sign (barriers); An Action Plan; and The Road (the people who will offer support). I want Ben to contribute to the discussion so thought I'd set up these sections on his communication software on the iPad. Recently, Ben has made it clear that he's not interested in using the Proloquo. He's deleted the software a number of times and when encouraged to use it, says "it's boring." After all my efforts to get this functional, I think I need to rethink his options for expression. But yesterday, I realized the Proloquo may be a neat way to have him contribute to the planning day. I created a "My story" category and asked him: "What would it be important for people to know about you?" "I'm happy," he signed. So I typed in 'I'm' and he typed in 'happy' and I asked him to choose a photo that would go with this description. 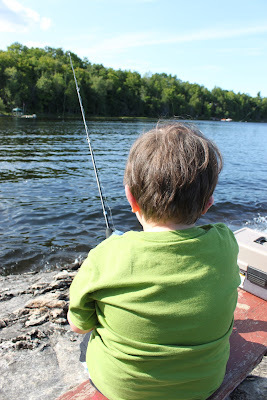 He immediately clicked on the pic above of him fishing at camp. I know he's not always happy, and his disabilities cause him great frustration and anxiety. But my heart lightened thinking that he still views himself -- overall -- as a happy person. Maybe this process will yield other surprising results.